Jack Kay, Scientist in Molecular Biology, Ingenza Ltd.
Jack’s excellent scientific development has played a key role within Ingenza’s Antimicrobial Peptide Project. 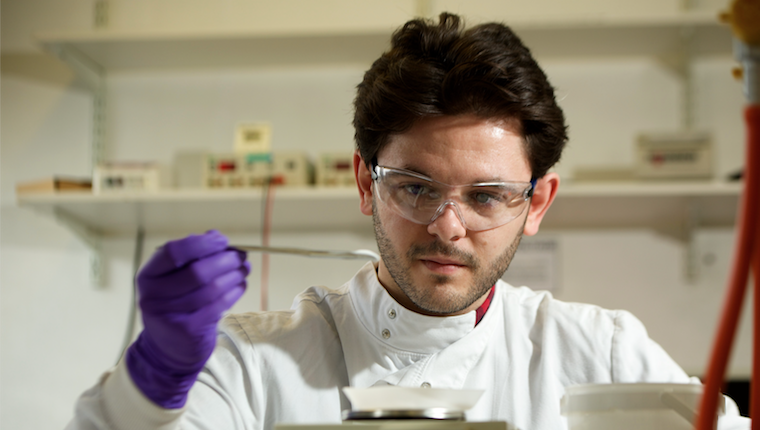 Jack has had several roles since joining Ingenza as a Modern Apprentice, but it is his work within the Antimicrobial Peptide Project that has seen him flourish. Jack has been fundamental to the technical success of this project through important contributions to both the production and purification processes that will hopefully lead to commercial manufacture of novel antibacterial peptides at Ingenza. Jack’s own initiatives to identify and overcome complex mechanisms of bacterial resistance in the design of new antimicrobial peptides are inspiring and greatly appreciated. While doing this, he has also been studying for a Chemistry degree at Heriot-Watt University. This has required him to show an excellent level of commitment and work-ethic to balance both his work and university obligations. Jack has developed his scientific abilities and is now an accomplished molecular biologist and protein chemist, capable of engineering several bacterial hosts, and developing complex protein purifications. His diverse skill set and critical thinking are an asset to Ingenza. Jack joined Ingenza in 2012 when he was 17 years old straight from Musselburgh Grammar High School and he embarked on the role of ‘Life Sciences Modern Apprentice’. Whilst working at Ingenza, Jack attended Forth Valley College in Falkirk where he achieved both an HNC and HND in Life Sciences. Jack was then promoted to ‘Molecular Biology Research Assistant’ at Ingenza but his studying did not end there as Jack attends Heriot-Watt University on a weekly basis where he is studying Chemistry with Industrial Experience. This is predominantly in his own time whilst still working full time at Ingenza. This year, Jack has been promoted to ‘Scientist’ within the Molecular Biology team. Jack has taken part in a variety of STEM activities over the years from speaking at local schools to representing Ingenza at multiple community engagement events and he continues to inspire many young people into a career in Industrial Biotechnology. Ingenza is a world leader in the application of industrial biotechnology and synthetic biology, providing efficient, scalable bioprocesses for the manufacture of chemicals, biologics, pharmaceuticals, agrochemicals and biofuels, from sustainable sources. Our unique approach is based on the power of integrated science. Combining experts in molecular biology, fermentation and process chemistry within one team gives our customers an outstanding resource, unlocking and transforming opportunities into new manufacturing routes. Jack is based within the Molecular Biology Team at Ingenza, located at Roslin Innovation Centre, where he is supervised by Dr Scott Baxter. Jack’s dedication to a career in life sciences since a young age is an inspiration to all within the industry. His career path highlights that there are many ways young professionals can work their way in to the sector and reinforces that there is support available within the industry that allows you to flourish. Learn more about organisations you could be a part of or collaborate with, here.